New Life Nicaragua is a Christian ministry founded in 2002 with a vision to demonstrate the love of Christ and the eternal hope found through Jesus to the Nicaraguan people. Their goal is to do this through nutrition centres, pastoral training, housing for orphaned children, and the construction of homes and church buildings for the community. For the past decade, they has been working to build modest and efficient housing in Cristo Rey, an area in the east of Managua, starting and maintaining nutrition centres for children, supporting education and offering assistance to many needy families. The purpose of this project is to grow the ministry’s ability to provide assistance to families and children in Managua, especially on the west side. To achieve this, New Life Nicaragua has recently purchased a 4.25 acre site in west Managua with the goal of developing a Children’s Home, a Nutrition and Vocational Training Centre, and a Community/Conference Centre. In December 2016 New Life Nicaragua invited EMI to partner with them to create a masterplan and provide conceptual building designs for their new property. In May 2017, a multidisciplinary EMI design team joined the New Life Nicaragua staff, visited the site, and discussed in detail the ministry’s needs and vision for the property. The EMI team investigated the site, performed detailed surveys, created a masterplan and developed conceptual designs for a new Community Centre (that included a nutrition centre, vocational training workshops with associated gift shop and cafe, administrative offices and a chapel), a new Children’s Home, a Dining Hall/Conference Centre, and Housing for the ministry director, short-term volunteer staff and short-term mission teams. This housing will be supplemented by the renovation of an existing house into further team housing (previously designed by EMI). The masterplan was designed to fully integrate the existing building into a comprehensive overall plan. After this initial design trip in May, EMI Nicaragua has been developing the new masterplan and concept designs alongside a series of documents, drawings and reports that will enable New Life Nicaragua to take the project forward and to realise their vision. 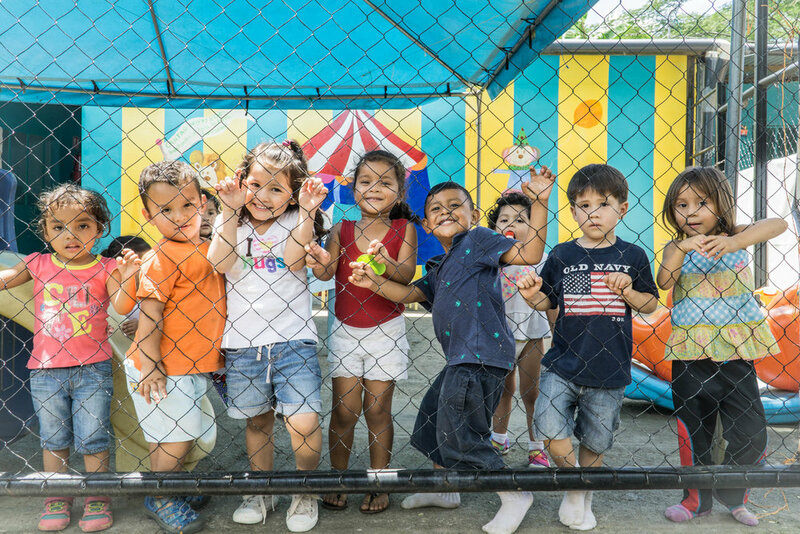 At the heart of the vision for the development of New Life Nicaragua is the idea that people can be restored to God through the care and nurturing of children and families in desperate need. New Life Nicaragua provides hope for children and families in need of better living conditions, nutrition and vocational skills. They also plan to provide comprehensive care for children who have no families at all. 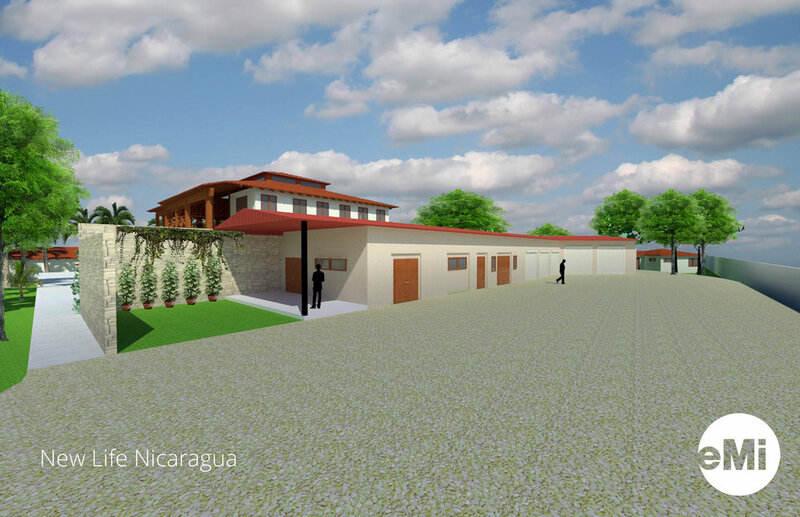 Through the project proposed in this report, New Life Nicaragua will be able to better provide for community needs through the construction of a new Children’s Home, Community Centre, Dining Hall/Conference Centre, and Missionary Housing. Before the arrival of EMI’s design team on-site, EMI was asked to make recommendations for the renovation of an existing residence located near the west side property line of the site. Since this building will be used as guest housing, for short term mission teams, its location suggested an appropriate location for all other temporary housing needed to support the ministry. In response to the ministry’s housing needs, apartments and bungalows were also located on the west side of the site near the existing guest house. As a result, the masterplan utilises the entire west side of the site to develop a residential neighbourhood that will serve as a quiet retreat area for both short term and seasonal volunteers working with the ministry. Existing mature fruit trees and vegetation, along with a gently sloping terrain on the west side of the site, reinforce the decision to develop ministry housing on this end of the site. The location of the Children’s Home was also crucial to the development of the masterplan. Factors such as government regulations, child safety and environmental context played a role in the decision to locate the home in the northeast corner of the site. This area of the site is planned to be the primary entrance to the site and will facilitate government access to the home, while at the same time enabling the home to be separated from “foreign” short term mission teams. The northeast corner of the site has mature cedar trees, excellent exposure to prevailing northeast breezes, and is directly adjacent to a modest residential property, all of which lends to a quiet and safe environment for the Children’s Home and playground. Directly adjacent and south of the Children’s Home will be the Missionary Housing which will be used by the ministry directors and their family. Placement of this residence in close proximity to the Children’s Home enable’s close overview of the children’s care by the directors. Another important decision in the development of the masterplan was the placement of the Community Centre. With the requirement for the Community Centre to be easily accessible to the public and in close relationship to the Children’s Home, the Community Centre was placed along the northern boundary of the site, alongside one of the two streets bordering the site, and directly west of the Children’s Home. The location of the Community Centre allows easy access to the site by people arriving on foot or by car. It is anticipated that the Community Centre will be the “face” of the project. The masterplan hopes to create a welcoming atmosphere at the main entrance directly in front of the Community Centre. A grand entrance pergola with steel rail gates and a landscaped “open” steel rail fence will be constructed along the north property line between the Community Centre plaza and the parking lot on the public side of the fence to create a more open and welcoming environment at the main entrance. At the heart of the masterplan is the Dining Hall/Conference Centre. Centrally located on the site, it will support the entire ministry community with food service, an open air ranchon, several small meeting rooms and two toilet facilities – one of which will double as a bath house for the adjacent pool. This facility is envisioned to be a central gathering spot for not only the many and varied activities taking place on campus but to serve the wider community of Managua with a wonderful location to host seminars, guest speakers, concerts and any number of events where a large dining and conference room is needed. Throughout the site, the masterplan shows well organised pedestrian and vehicular circulation systems that have been purposely designed to promote safety and to create pleasant and graceful opportunities for people to enjoy the site’s natural environment. 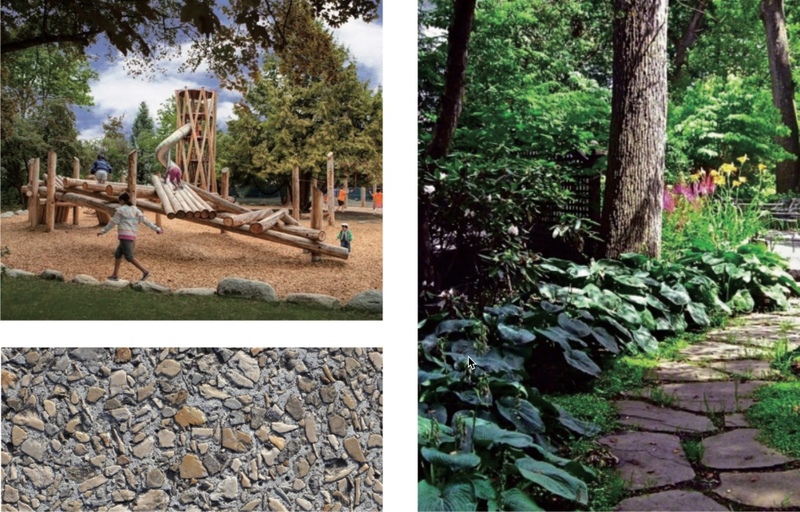 Where practical, building placement takes into consideration the many natural elements found on site. 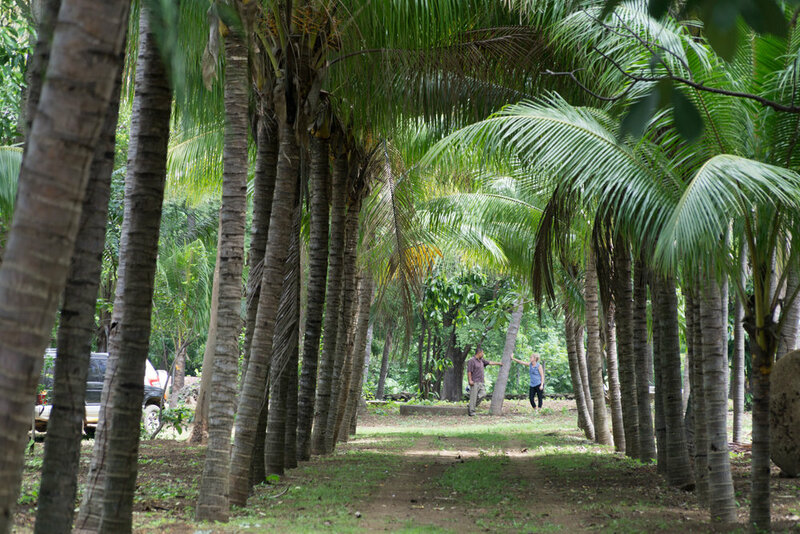 A group of 3 large and mature mango trees were preserved to the west of the Dining Hall/Conference Centre, Cedar trees in the northeast corner of the site were carefully protected when locating the Children’s Home and the graceful rows of existing palms interior were preserved where possible. Where palms were removed to provide ministry program elements, the masterplan takes into consideration the replanting of at least one row of palms to recreate the ambience of the original palm trees. According to the local Alcaldía, the road that borders the west side of the site will be improved by regrading and paving the street. This work will signifcantly improve the site’s accessibility and will increase the number of people who will be able to take advantage of the ministry at the site. A secondary site entrance accessing this street has been shown in the masterplan and will facilitate site access by ministry vehicles. Placed along the north property line adjacent to the street, the Community Centre will have a public plaza designed to serve as a public gathering area. This space will support community activities and will serve as pedestrian circulation for the buildings that surround the plaza. 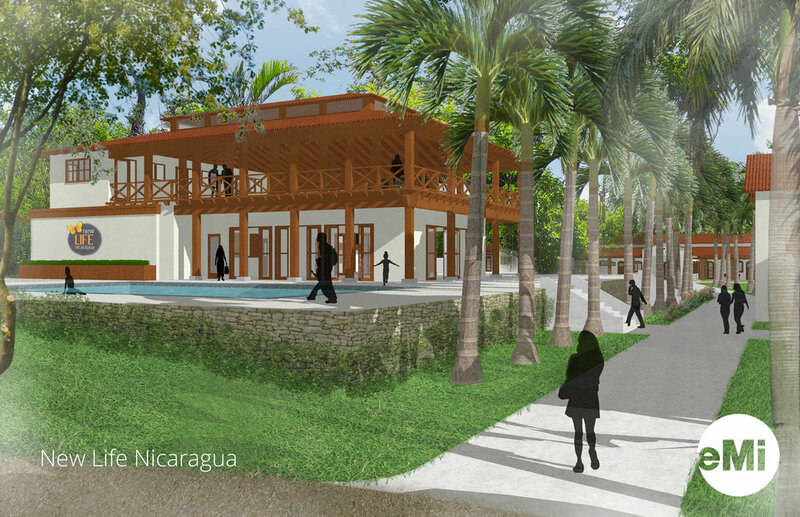 The Community Centre will be the most public building on the campus and in essence the face of New Life Nicaragua in the community. Comprised of five individual buildings, designed to be constructed under one roof, the Community Centre will be have a multipurpose room, nutrition centre, administration , chapel, coffee and gift shop and a workshop and lockers rooms for employees. Each of these buildings are anticipated to serve unique ministry needs and will be one of the principle ministry focuses. The buildings have been designed with a covered pedestrian walkway that will connect each building. Conceptually, the Community Centre is designed to function similar to a town square and central park. The intention of this concept is to provide a familiar environment for the community. Upon entering the landscaped plaza, visitors will be able to choose from various activities or services. All Community Centre buildings utilise passive energy concepts. Windows placed directly across the room from each other provide excellent ventilation and natural light and vented roofs draw heat upward and out of the building. Roofs overhangs provide protection from rain and prevents sunlight and heat from penetrating the building. The Multipurpose Area, will also serve as a Nutrition Centre. From high-activity exercise, to educational classes, or food service, the Multipurpose Area is designed to support flexible use. It will be provided with glass doors around the perimeter that will provide flexibility of entry/exit points or can be locked off to serve only as windows. This building will have a commercial kitchen that will be used to serve meals and can also be used as an educational training kitchen to demonstrate proper food preparation skills and nutrition concepts. Close proximity of the Multipurpose Area to the Children’s Home enables each facility to take advantage of the resources the other has to offer. Since the Multipurpose Area offers a highly flexible environment, New Life Nicaragua could also use this area as a secondary meeting space or dining area, if additional space was needed to support the Dining Hall/Conference Centre. Administration will be located in the southeast corner of the Community Centre, and will be easily accessible from multiple locations. It will have a traditional office function that includes a reception area, conference room, private offices and an area supporting staff in semi-private office cubicles. As part of the plan, the space will have a small work and storage area and a private toilet area. Like all of the buildings being planned, there will be operable windows to take advantage of local breezes and to enable users to have views of the site’s natural beauty. The centrepiece and focal point of the Community Centre will be the Chapel. Positioned directly in front of and across the plaza from the main entrance, the Chapel will maintain its traditional place of importance in Central American communities and will provide an important reminder that God is at the heart of New Life Nicaragua. The Chapel’s design is intentionally simple and in keeping with the architecture of the surrounding buildings. However, to create some distinction, the Chapel was designed with a more prominent roof structure. The covered walkways, connecting the adjacent buildings, also stop alongside the Chapel, giving the building a greater sense of identity. Since the Chapel is located between two buildings a garden space was introduced on each side to provide opportunities for natural light to penetrate deeper into the Chapel and to allow a connecting passageway from the Community Centre to the rest of the site. 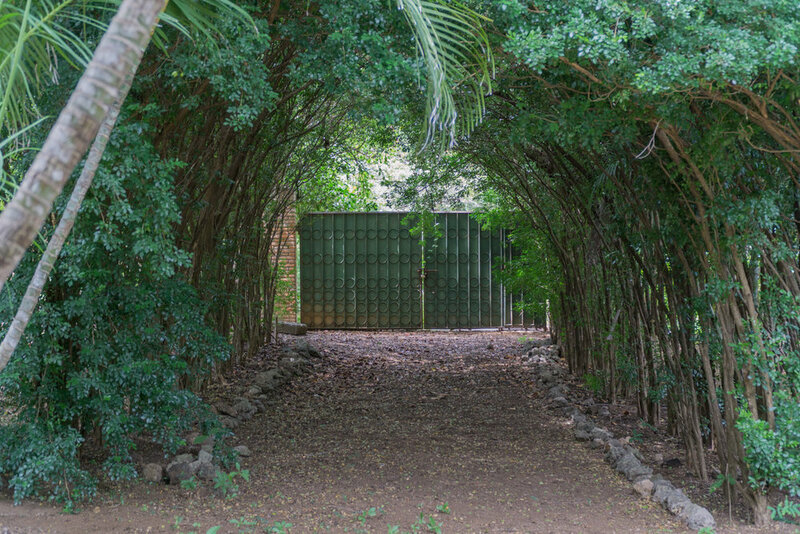 It is anticipated that these garden passageways will be gated to control public access, especially during the daily operating hours of the Community Centre. These areas are protected from rain by a clay tile roof, but a portion of this roof has been changed to a translucent plastic panel to allow filtered sunlight to enter in. The entrance to the Chapel looks directly towards a cross- shaped window at the front of the building. As noted the Chapel has been designed with an elevated roof, to bring emphasis and focus to the Chapel from the outside. The resulting volume on the inside is equally important. With high vaulted ceilings and focused light, it is hoped that the space inside the Chapel will focus and encourage worship, and give an increased sense of just how awesome our God is. The interior design of the Chapel should be basic and simple in terms of material and decor – letting the space itself speak of the purity of Christ and the hope that He brings to our lives. The coffee shop will serve the public, short term mission teams, and those participating in conference activities. Located for convenient access by short term mission teams, the Coffee Shop includes a small expresso bar that will serve coffee, desserts and light snacks in an area that will also display and handmade crafts handmake on site. These goods will be made by local community members being trained on-site in the adjacent Workshop Building. The Workshop will include an employee a locker room, workstations for craftsmen storage, a toilet area, a gift shop/ retail sales area where craftsmen can display their crafts while practicing their skills. The workshop space will provide a unique opportunity for craftsmen to develop both trade and sales skills. A major goal workshop model is for people to develop confidence to start their own business. The Workshop and Coffee Shop will function together in their respective operations to facilitate and maximise ministry potential, to increase sales to support ministry goals, and to better support those learning a new skill. Covered walkway areas surrounding the Workshop and the Coffee Shop can be used for additional retail sales and outdoor dining as well. Both spaces can function independent of or in coordination with each other, which provides the ministry with optimal flexibility in how best the two functions benefit ministry goals. A key component in the new masterplan will be the Children’s Home. The proposed design will be able to provide care for up to 42 children through the provision of 3 individual living units, each designed to provide a living experience more like living in a residence than in an institution. Each living unit supports 14 children and is divided into 2 separate sleeping rooms that accommodate 7 beds and 2 bathrooms each. An area for supervisory staff connects the two separate sleeping rooms. The sleeping rooms are connected to a family room that is designed like an open plan dining and living room in a family residence. The idea is to provide a space as similar to living conditions outside the Children’s Home as possible in order to enable a smooth transition to life outside the ministry environment. All of the living units are directly connected to a large indoor play space at the core of the Children’s Home. The play space will be a multipurpose room designed for flexibility in the delivery of the various program functions required to properly care for the children and staff . The volume of the play space will be increased through the provision of high vaulted ceilings that follow the slope of the roof above. Necessary program spaces such as an art and craft area, kitchen, visitation room and reception/office area will surround the play area. With child security being a major design consideration, both the visitation room and the reception/office will be directly adjacent to the public entrance to the building in order to facilitate access control. For each living unit, an outdoor patio area has been provided for the children. Each patio will be enclosed by a fence constructed of a small 1m high concrete wall with open metal security railings on top. This fence allows great visibility and fresh air, while also preventing young children from leaving the facility without supervision. 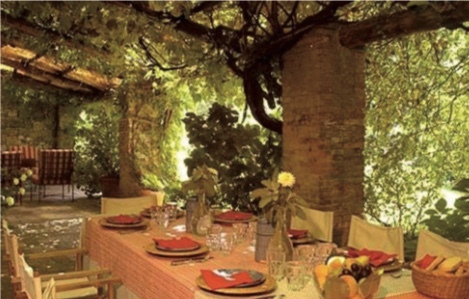 It is anticipated that these patios will have vine covered pergolas above to provide shade from the intense sun. A playground has been placed alongside the home, between the Mission House and the Children’s Home. This location allows for easy supervision from both homes. The playground centres on a large existing cedar tree. This tree is a beautiful specimen and every effort should be made to maintain and protect it during the construction of the home and playground. This tree will provide not only wonderful shade but exciting opportunities to integrate it into playground development. A tree house has been suggested but has not been included as part of the design. Mention of it here is meant to encourage such a feature. Located at the heart of the site will be the Dining Hall/ Conference Centre. This essential component will serve as the central gathering area for the campus. The Dining Hall has been positioned on the site to be equally inviting to all other ministry functions. Since its walls can be completely opened up on 2 sides, through the use of large bifolding glass doors, a grand entrance can be created to welcome everyone into the facility. The Dining Hall will seat up to 112 people when using round dining tables for 8. Should the Dining Hall area be used as an auditorium, the space provided will easily support up to 160 people if using chairs only. On the lower floor, the Dining Hall/Conference Centre will have two toilet rooms, one to support the adjacent pool area and one to support dining and conference activities. There will also be a large commercial kitchen to serve the main space. The kitchen will be equipped with hand sinks, prep sinks, a three- compartment sink for dishwashing, and refrigerators and freezers. For cooking equipment needs, it is typically best to determine the menu to be served prior to equipment selection, however; a range and oven would be important and potentially several warming carts and cooler cases to keep prepared food at the right temperature prior to service. The upper floor has been designed to provide maximum flexibility to support changing ministry needs. The space will be a large covered open-air space, with several smaller rooms located on the south side. These rooms can be used in any manner desired by New Life Nicaragua, but have been designed to function primarily as small meeting rooms or storage as needed. The remainder of the upper floor has been designed as a space that could be used for various types of activities from simply a place to relax, read a book, for small group meetings, or as an open-air auditorium. If used for large group meetings, the space would be able to support 200-350 seats. This upper floor offers good views over the pool area and the rest of the campus, and will be able to take advantage of prevailing breezes coming from the northeast. Situated near the middle of the site, the Maintenance Building has been designed to accommodate the storage of ministry vehicles and to provide a maintenance shop, general storage, and a laundry area. It will be located directly behind the Dining Hall/Conference Centre with sufficient room between the building and the south property line security wall to facilitate the required turning radius of ministry vehicles. The garage will have room for 2x 30 passenger buses and 3x 15 passenger vans. Additionally, to save room on the turning radius, a portion of the garage was turned at an angle and will have overhead doors on both sides of the building to facilitate straight through passage. The design for the remainder of the building is straight forward and utilitarian in an effort to simplify the design and reduce the cost of the building to a minimum. The north side of the building, facing the other buildings, has been designed as a simply landscaped wall that serves as a backdrop to the other activities on site. The idea is to create a structure that does not draw attention to itself, while at the same time does not detract from the overall design and aesthetic of the campus. One of the first buildings to be built on the property will be the home for the ministry directors and their family. By building this first, New Life Nicaragua will be able to have someone on-site throughout the construction of the other buildings. This provides on-site supervision and security for valuable materials and equipment during the development of the property. The Mission House will be located in the southeast corner of the site adjacent the Children’s Home, and purposely separated from the west side of the site where there is expected to be ongoing activity from the mission teams supporting the ministry. The proposed location also allows for added privacy for the director’s family. To facilitate this, a fence will be built around the house. This will be gated and constructed similar to that near the Community Centre, using a low height concrete wall and an open metal rail above. The concept is to provide separation without isolation. The Mission House will have an open family plan that includes a large entry hall, a family room, dining area and kitchen, all of which are open to an internal courtyard. An office on each side of the entrance will provide an area for the directors to be able to take care of ministry business while at home. To support the needs of the current director’s family, the home will have five bedrooms and four bathrooms. Two of the smaller rooms will share one of the bathrooms. A separate guest bathroom has been designed adjacent to the indoor laundry area. The floor plan embraces traditional Spanish Colonial architecture and planning, by providing an interior courtyard within the residence. While the courtyard is open ended, the overall concept focuses the interior space around the exterior space through the open patio and covered terrace. This space will allow for natural light and improved cross ventilation throughout the house and at the same time enable the family to have a quiet and private outdoor space. The Guest House will be used by short term mission teams participating in various New Life Nicaragua ministry opportunities around Managua. Structural improvements will be necessary to ensure the viability of the proposed use, however, they are not expected to be cost prohibitive. 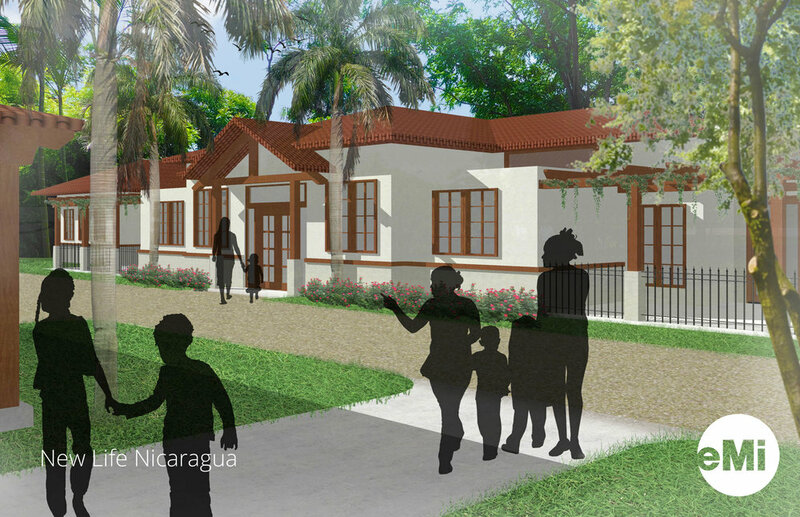 Overall the existing building will be a valuable resource for New Life Nicaragua. There are two proposed living areas for volunteers. A central common space separates the two living areas and is planned to be used for a reception/lounge, central dining and a kitchen area. Each living area has an exterior covered terrace directly adjacent, which could be used for anything from team meetings to dining or simply time alone. There is also a second smaller covered terrace on the opposite side of the living area. The size of these smaller terraces makes them perfect for a more intimate experience. On one side of the Guest House, the living area is a dormitory that will sleep up to 12 people in 6 bunkbeds. The dormitory will have a bathroom with 3 stalls, 4 toilets and 3 showers. On the other side of the Guest House there is an identical arrangement with a dormitory, adjacent bathroom and showers, but there are also two additional bedrooms, each large enough for a double bed, and with a private bathroom. New Life Nicaragua expects to have volunteers that will live on site for several months at a time. To support the housing needs of these volunteers, three apartments will be built. The proposed plans are simple and effectively incorporate a living room, dining room and kitchen into a single open plan. There will be two bedrooms of similar size and a bathroom that will be shared between the two bedrooms. They are large enough to support one double bed or two single beds. Depending on need, the apartments would be able to sleep from 2 to 4 people. It is always important, in the design of residential spaces in Central America, to provide an outdoor living space and so a generous covered porch has been designed for the residents. The entire apartment has been designed to have optimal cross ventilation and to take advantage of available breezes. Installation of ceiling fans in all rooms would assist in maintaining a comfortable environment throughout the day. The apartments have been grouped together on the southwest corner of the site and positioned in a way that will encourage community and interaction between the residents. The porches will be visible to each other and will be close enough to support communication, while at the same time be able to maintain privacy. All apartments back up to the security wall and have ample area to support the development of gardens, patios and more intimate spaces for the residences as may be desired. New Life Nicaragua also expects to host more teams and people than the proposed Guest House will have the capacity to support, and so there will be a need to provide additional housing. 3 Bungalows will provide additional housing that can sleep up to 8 people each. The proposed plans are simple one room units that will provide an open dormitory style living arrangement. Directly adjacent to the sleeping area, 4 private bathrooms will be provided. Two of those will include shower units, with a toilet and sink, while two will have only a toilet and sink. For convenience, the Bungalows will also have 4 additional sinks located outside the bathrooms. Similar to the Apartments, the Bungalows will be provided with a large covered terrace to facilitate social interaction of the team. Also similar to the Apartments, the Bungalows have been arranged in a semi-circular pattern to enable people living in Bungalows to easily interact with those in other Bungalows while maintaining a sufficient level of privacy for each individual group. The Bungalows have been placed in a quiet area of the site near one of the largest mango trees, which will provide excellent shade and privacy. The existing site contains many mature trees and was developed by the previous owner much like an oasis of tropical fruit trees. With the construction of the proposed new buildings for the site, many of these trees will unfortunately have to be cut down. Most specimen trees, however, should be able to be preserved by the careful placement of these buildings. The proposed masterplan only shows newly planted palm trees to replace some of those that will be removed to construct the Community Centre. However, there may be many other opportunities on the site where replaced trees make sense. At the time of this report, it is difficult to fully recognise or comprehend the impact that cutting down many of the trees will have. At first, the impact may seem overwhelming but it should be viewed as an opportunity to further enhance the site in ways that can actually improve the site beyond its current beauty. It is the recommendation of this report to plant trees and other types of landscape materials in areas shown on the masterplan sooner rather than later. With careful planning, these materials can be planted in areas that will not be in the path of future construction. If action is taken now, the overall site will be maturing into the future in advance of the proposed buildings, instead of building and then waiting for the landscape to mature. This report has shown images of landscaping to cast vision and to demonstrate the potential for many of the areas around the site. All materials should be evaluated with respect to growth potential in areas of sun, shade, and partial-shade, as well as the size and spread of the plant or tree being considered. Often plants are not planted with sufficient spacing to give the appearance desired in the future, when compared to the day that it is placed.